Zachary Kerr of Methuen, Mass., was born an identical triplet. But unlike his sisters, he identified as male from a young age. In an interview with journalist Francine Russo, the transgender college student discusses his experiences and offers advice to other transpeople. What is your earliest memory of feeling you were a boy, not a girl? My parents tell me that at age three I announced, “I’m a boy,” and everyone laughed and said, “Oh, no, you’re not.” And that denial went on all my life. My earliest memory is a car trip when I was about four years old with my parents and siblings—my three brothers and my identical triplet sisters. We stopped to use the bathroom. Dad said all the boys should follow him to the men’s room, and without thinking, I just followed my dad because that’s what felt right. “No, no, you belong over there,” he said, pointing to the women’s room. I was confused, but I justified it to myself, saying that I have to do everything like my sisters because being triplets was a big part of our identity. How anguishing did your gender dysphoria get? Could you describe a particularly painful time? My entire life I had a heaviness in my chest, feeling sad and not knowing why. For a long time I knew something was off but I didn’t have the language to express it. In the 2000s we weren’t having this big transgender conversation. The disconnect between knowing I was a boy and everyone treating me like a girl got worse and worse. When I was 14, my depression got even worse. I felt this is the person I know I am, and people aren’t listening to me. This will never change, and there is no future for me. I thought about suicide a lot, and once I made a half-assed attempt. It got worse after I came out. I felt, “I don’t think I’ll ever be able to be a man.” Then, when I was 16, I met another transperson who had medically transitioned. “Wait,” I said, “this is possible?” It changed my life. Was it hard to come out to your family as trans? How did you do it? I came out to my sisters first because we share this incredible emotional connection. They finally just got it. With them I was less afraid of rejection but I had a fear they’d feel like I was taking away a part of our shared identity as identical triplets. I was more afraid to tell my parents. Whenever I wore male clothing or did anything else male, my mom would yell at me, “You’re not a boy! You’re a girl!” I was afraid of not being taken seriously, and I was afraid of rejection. My dad took it pretty well but it was harder for my mom. She had a real sense of loss: “I’m losing my youngest daughter” is what she said. (I was the last born.) But she finally did come around. Were your peers accepting of you? Did you get bullied? Most of my friends have been accepting. A few classmates said some things that were not nice, just not okay. They would still call me my female name after I’d had my name legally changed. Also, there was one teacher who said inappropriate things about my gender identity. Reactions among my peers didn’t differ by their gender but by the kind of person they were and the experiences they’d had. I think there’s less stigma for trans-guys than transwomen. The way I see it is that in our very pro-masculine society people can understand why a woman would want to be a man and become masculine. But people are less understanding and are more threatened by men who are women because of the threat that is to masculinity in our culture. As you went through the process of transitioning, which decisions were hardest? Were any easy and obvious? Deciding to medically transition was easy. I wanted what other boys had—the facial hair, the deep voice. The day after I found out it was possible I asked my mom to take me to a gender specialist, and she found me Boston Children’s Hospital. One of the hardest decisions was picking a new name. I’d been attached to my female name and I tried out a couple of male names that didn’t feel right. Then I asked my mom. She was having such a hard time with my transitioning that I thought maybe it would be easier for her to call me a name she liked. So I asked her, “What would you have called me if I had been born a boy?” “Zachary,” she said—and I liked it. What does your current medical treatment involve? Do you plan any surgeries in the future? I give myself testosterone injections once a week. I had top surgery in 2014—breast removal and chest reconstruction. I’m fully and biologically male. I’m just a man who’s got a different kind of body. Right now I’m comfortable with my body as it is. If that changes later, I might consider other surgery. Have any psychologists or therapists been helpful and in what ways? I’ve seen my therapist for years now, since beginning my transition. One of the best things he did is to accept that I simply am transgender and that not all my issues are about my gender identity. I had problems with various people in my life, and I had anxiety about stuff that wasn’t related to my being trans. I also needed to figure out what my future would be like. So how do you envision your future? Now it’s simple! My prospects are all open to me. I want to be proud and happy. I’m getting my degree in social work and I want to get a job I really like, working, I hope, with the LGBT community. I want to marry someone I like and have a good life. Are you finding it difficult, as a transgender man, to have a romantic life? Right now I’m with the partner I hope will be in my life forever. He is also a transman and is also gay. Before I met him, when I felt I was straight, girls looked at me as only trans. They’d say, “Oh, I really like you and would like to date you. Too bad you weren’t born a boy.” But I was! If my current relationship doesn’t work out, though, I think I would not have trouble finding someone accepting but really only someone in queer spaces. Some cisgender* people are cool but most would not be there in terms of dating. 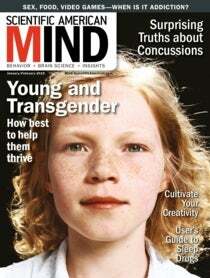 What advice would you give to young trans people about how to come out? Every time you come out to a new person there’s that fear of rejection. In college I had to come out to new friends or a new professor every semester. Feel them out first; don’t just blurt it out the first time you meet them. With your parents you will be the best person to know whether it is safe. Just remember, your [emotional and physical] safety always comes first before anything else. Make sure you have the support you need—from friends, a guidance counselor at school, anyone who will back you up. Be sure you have someplace to go if the worst happens—a friend’s or a relative’s house, a community organization, a shelter. Remember, many people out there have transitioned and will support you. You will not go through this alone. *The term “cisgender” means identifying as one’s biological gender—that is, not transgender or genderqueer.